As a jeweler and gemologist, people often ask me to examine their jewelry. Sometimes they want to know if their gems are real or as good as they were led to believe. Other times they’re concerned about whether the setting holding their stone is secure. The reasons someone wants their jewelry examined can vary as much as the sky in spring, but there’s one nearly universal characteristic that I find: at the most basic level, their jewelry is not in optimal condition. When I say “not in optimal condition,” I’m being polite. In more direct terms, it’s filthy. I’m not saying that it’s caked in garden mud, but under the magnification of a jeweler’s loupe or microscope, the dirt of daily life is readily visible, and often it’s enough grime to affect the appearance of the stone. Of course, rings suffer this fate more often than necklaces, earrings or even bracelets, because our hands take far more abuse than other parts of our jewelry-adorned bodies. Juicy tourmaline, loved for its many colors, is susceptible to scratches. While popular for rings, incorporating it into necklaces or earrings is a more carefree option. Image copyright HUWBijoux, LLC. 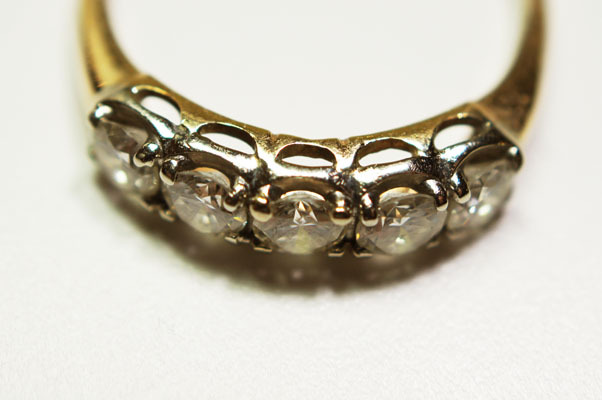 The normal wear-and-tear of daily life can wreak havoc on jewelry. Sweat, body oils, and salt stick to gemstones. Exterior substances like cooking grease and household cleansers can leave deposits on stones; some cleansers can scratch soft stones, or alter enhanced colors. At this time of year, when so many of us are dealing with cold weather and constant hand washing to avoid the dreaded flu, our hands get dry. Those lovely lotions that bring such relief to our chapped and irritated fingers make a mess of rings, as the lotion fills the tiny crevices of the setting, clogging the spaces between the metal and the stone. Once there, they dry and stick, dulling the appearance of the gem. The settings on rings are full of openings and crevices that can become filled with dirt. Image copyright HUWBijoux, LLC. A few years ago, someone asked me to examine their diamond ring. The owner mentioned repeatedly that they had paid quite a bit for the stone, and they were obviously very proud of it. To the naked eye, the stone appeared to have an enormous, unattractive, dark inclusion – something foreign inside the stone – that in this case would negatively impact the value of the stone, and possibly even the durability. The stone was not particularly sparkly, nor pretty, and I was concerned about the news I might have to give the client. Most gems have inclusions; that’s not unusual. It is much more unusual, however, to see a large eye-visible inclusion in what is purported to be a high-end piece of jewelry. The ring was completely covered in heavy, caked-on debris. It was so thick, all the openings in the metal setting holding the diamond were completely blocked up with a substance resembling dried toothpaste. This paste-like material prevented light from reflecting in the gem, and was the reason the stone looked so dull and dark. As it turned out, the client rarely took the ring off, even for a moment, wearing it during all activities. That large, dark inclusion? It turned out to be an illusion caused by dried hand lotion, and it disappeared once the ring was properly cleaned. In the end, the stoned turned out to be a gorgeous gem. But who would have known? Sweat and body oils can wreak similar havoc, and while they are natural and can’t be avoided, jewelry should be cleaned periodically to remove their effects. Some other common hazards are chlorine (swimming pools), saltwater (ocean), household cleaning chemicals, abrasives, and acids, including common liquids like vinegar. Even when stones are arguably strong enough to stand up to these substances, mildly corrosive liquids can wear down the metal settings. I always advise clients to leave their jewelry at home when heading to the pool or beach, and that’s before even considering the impossibility of finding a stone that comes loose from its setting while swimming. For rings and bracelets in particular, bumps and bangs are a frequent threat. I have some clients who love bracelets above all other jewelry, but they can barely make it through a month without breaking a piece. 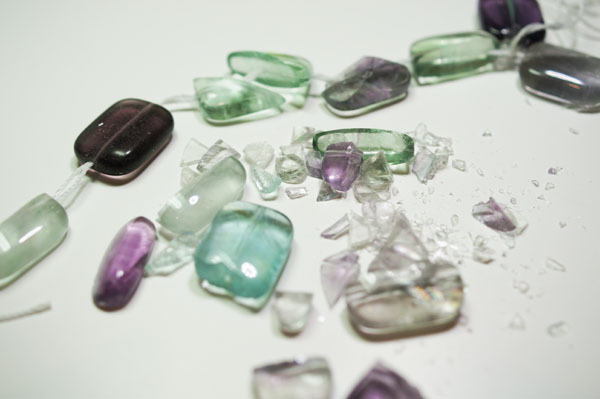 Many activities can break stones and scratch softer gems and metal settings. Digging in the garden? Lifting weights? Hammering? Not ring- or bracelet-friendly. Be safe; take them off. 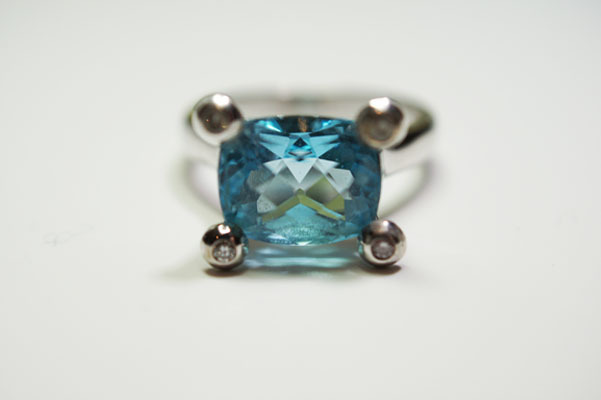 Blue topaz is a beautiful and popular gem, but it requires care due to its particular cleavage and fracture traits, which make it susceptible to breakage when struck or dropped. Image copyright HUWBijoux, LLC. Many of these issues may seem obvious, but others are lesser known. Sunlight can fade some gemstones. Kunzite is famously sun-sensitive, and can lose its pink hue quite quickly. Amethyst is another stone – and far more common – that’s susceptible to sun fading, so try to store amethyst pieces out of the range of direct sunlight. 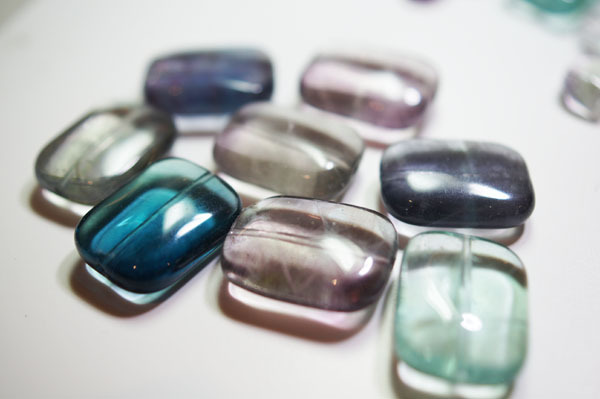 Stones whose color are enhanced by dye are also highly susceptible to damage from sunlight, as dyes are not stable sometimes, so store dyed pieces away from the sun. If you’re not sure whether a stone is dyed, err on the side of caution. 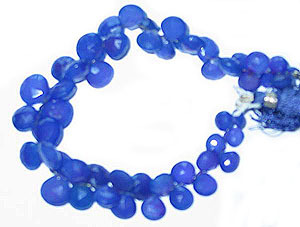 This is strand of dyed chalcedony beads, as the color appeared when they were first dyed. Image copyright HUWBijoux, LLC. Here are the same dyed chalcedony beads, after the dye-enhanced color faded. In this case, the dye color changed over time without exposure to sunlight, heat or chemicals. Image copyright HUWBijoux, LLC. Another “oddball” threat to stones is thermal shock, or dramatic change in temperature. I have many international clients who travel frequently, so I’m always preaching about the hazards of airplane baggage compartments, which are notorious for significant temperature fluctuations. Keep your precious bits and bobs with you in a carry-on bag if at all possible. 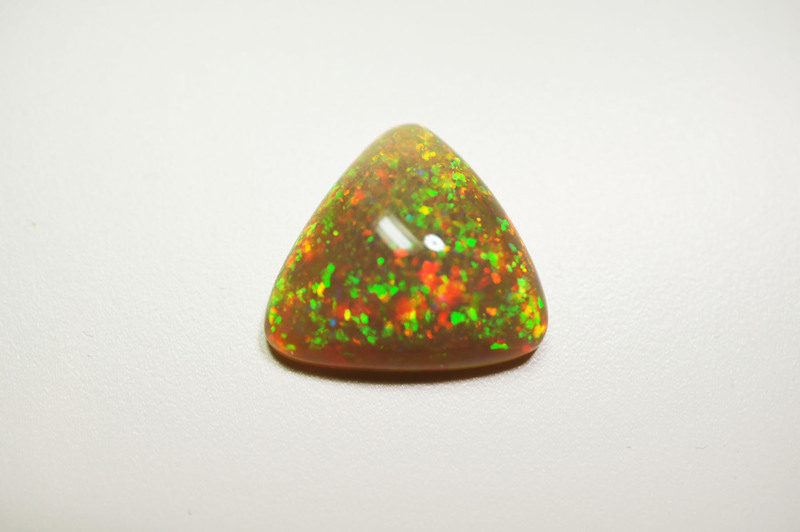 One of the more common stones susceptible to thermal shock is opal, which is sensitive due to the composition of the gem. An Ethiopian opal with its natural play of color, all those colorful, sparkly-looking bits. Opals can be damaged by sudden changes in temperature, even while they’re being cut and polished from their rough state. Image copyright HUWBijoux, LLC. 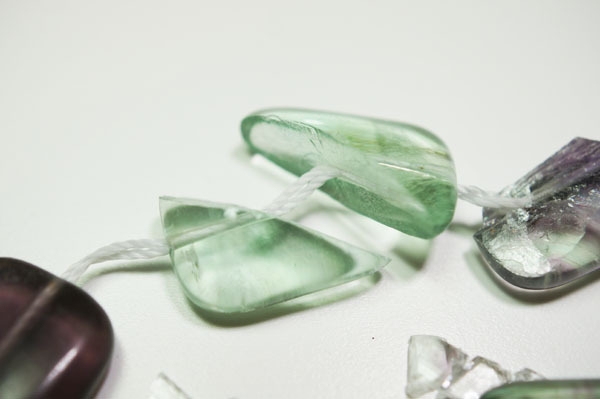 Another stone that can be damaged by thermal shock is fluorite, which is susceptible due to its cleavage; it can break easily in two different directions. I lost a strand of fluorite beads to thermal shock; they literally broke apart all on their own due to a temperature change. When I first put them away, they were lovely, pillowy rectangles. 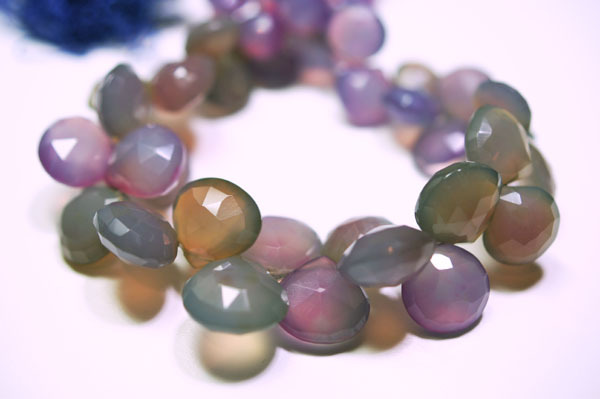 Fluorite beads, in their normal condition before being subjected to thermal shock. They were like pretty, fluffy pillows. Image copyright HUWBijoux, LLC. When I retrieved them, they looked like a bag of broken glass. It was quite a rude surprise, made less painful only by the fascination I had in studying what had happened to them. Here’s how the fluorite beads looked after experiencing thermal shock. Many of them shattered cleanly along their cleavage planes, leaving sharp, straight lines where they broke. These beads broke without being dropped or touched; it was simply an extreme change in a temperature. Image copyright HUWBijoux, LLC. Closeup of one of the fluorite beads. Breaks don’t get much cleaner than that. Image copyright HUWBijoux, LLC. Jewelry can be damaged simply through careless storage. Any material can scratch substances that are equally soft or softer. Diamond, being the hardest natural material on the planet, can scratch literally anything else in your jewelry box, including metals and other diamonds. 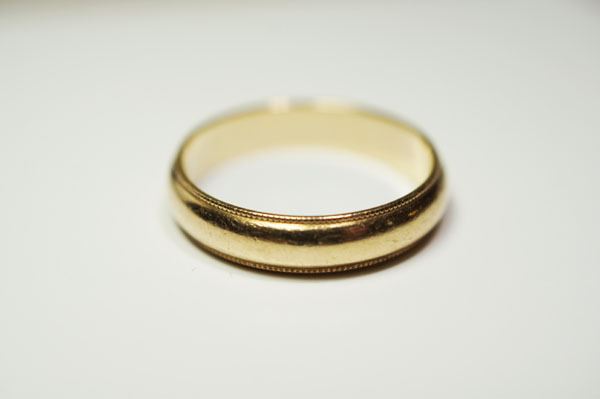 Wedding bands often have many scratches, as they are frequently worn daily, during all types of activities. Personally, I think it’s sweet to have minor dings in a wedding band, as it shows the passage of time. 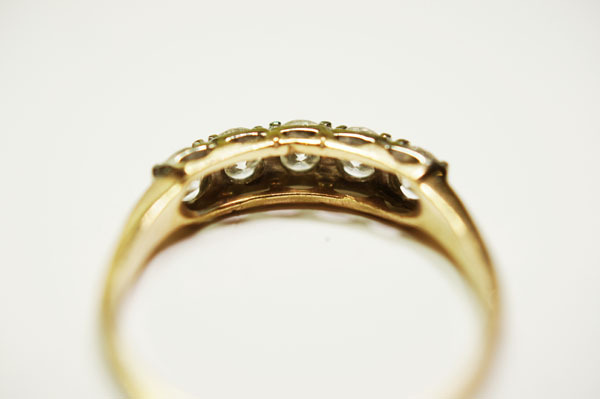 If you have too many scratches, a jeweler may be able to repolish your ring to eliminate light surface wear. Image copyright HUWBijoux, LLC. The hardest common gemstones after diamond are sapphire & ruby, spinel, cubic zirconia (manmade CZ), topaz, amethyst and citrine. Other common, but softer gems like peridot, tanzanite, opal, and moonstone are fairly easily scratched, but still less susceptible to scratches than the softest gem materials, like pearls, amber, turquoise and coral, which have no chance when rubbing up against metals or the harder gemstones. Store your pieces carefully, keeping them separated or wrapped individually, including earring pairs, as one earring can scratch its match. 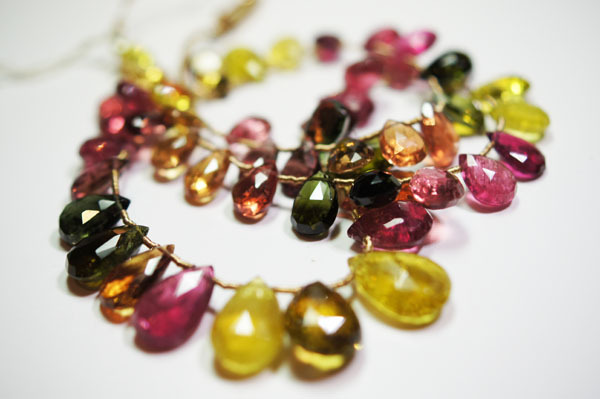 Humidity – or lack thereof – can negatively impact jewelry and gems. Vaults and safes are notoriously dry environments, which pose little or no issue for mineral-based gems like diamonds and sapphires, but can cause organic gems — such as pearls — to dry out, destroying the beautiful nacre that creates their gorgeous glow. I’ve had clients retrieve jewelry from a vault, and the gems were so dried out, they literally fell from their settings as they removed the jewelry from its storage boxes. If you are fortunate enough to have your own vault or safe, consider carefully placing a tiny container of distilled water in the vault, which could provide a humidity boost to help protect your pieces that are at risk of drying out. On the other hand, a storage environment that’s overly humid can cause fiber-based stringing materials to mold, so take care if you live in a humid climate. 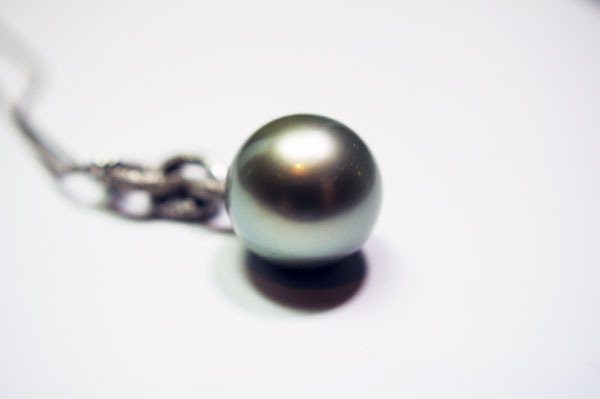 Store and wear pearls thoughtfully to ensure they maintain their glowing luster and overall surface quality. Image copyright HUWBijoux, LLC. One of the best ways to protect organic jewels, like pearls, is to wear them. A pearl’s appearance improves with normal wear, because the body polishes the gems. Locked in a vault and never worn, the luminosity of a pearl’s nacre can diminish. With pearls, it’s best to follow the old adage: pearls are the last thing you put on, and the first thing you take off. 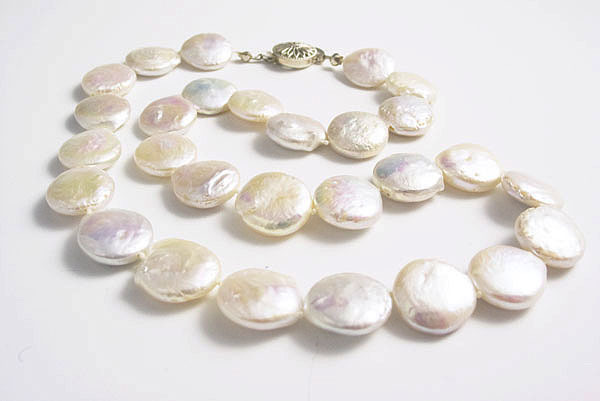 This helps protect them from substances like perfume, lotions and hair styling products, all of which can damage pearls. To keep them clean, simply wipe gently with a soft, clean cloth. Like pearls, turquoise is another gem that is easily damaged by foreign liquids. Turquoise is both soft and porous, which is great if you’re a gemstone producer and want to dye poorly-colored turquoise a prettier blue. For the jewelry owner, this porosity means that care must be taken to keep turquoise clean, so that it does not absorb liquids and oils – including natural body oils – which could change its color. Like pearls, put on turquoise last, and take it off first; wipe gently with a soft, clean cloth after wearing. This will help keep it looking good as new. 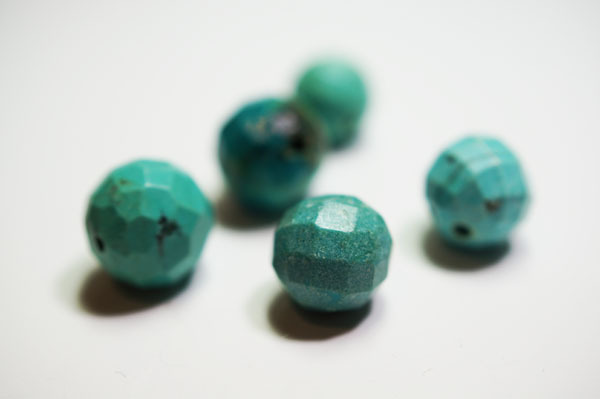 These stabilized turquoise beads have been impregnated with a polymer material to improve their durability and help protect them from foreign substances. Image copyright HUWBijoux, LLC. If you have a habit of removing your jewelry or watch and tossing them into your handbag, perhaps keep a small pouch or re-sealable plastic bag in your purse, into which you could more safely store your jewelry until you get home to your proper jewelry box. This will help prevent scratches, tangles, breakage, and a host of other hazards. Tangle-prone necklaces can be kept perfectly by simply leaving the clasp held just above the “zipper” part of the resealable bag. Delicate chains are particularly vulnerable to tangling — horrible, frustrating tangling — but there are multiple ways to prevent tangling. Image copyright HUWBijoux, LLC. 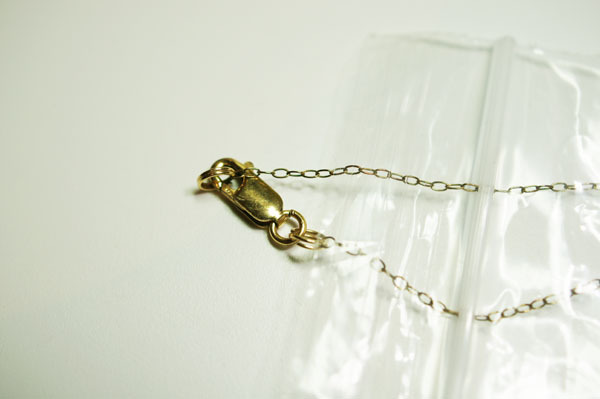 If you don’t have a way to store chain necklaces without them getting tangled in knots, store each necklace individually in a resealable plastic bag, and leave the clasp hanging outside the bag. 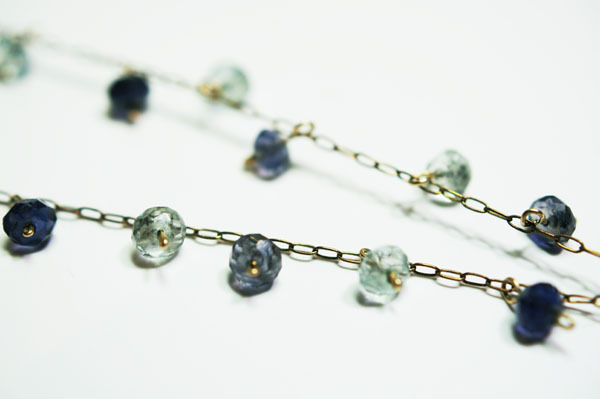 This will prevent the necklace from getting knotted on itself or on other pieces of jewelry. Image copyright HUWBijoux, LLC. So what do you do if your jewelry needs extra TLC? If it’s a piece you purchased from a jewelry store, they may be more than willing to provide you a complimentary basic cleaning with their specialized equipment, such as ultrasonic or steam cleaners, if those are appropriate for your particular piece. The jeweler will want your jewelry to look as good as possible, too, because it’s a great advertisement for them, and they want you to be happy and come back to buy more! If your setting is loose or broken, take the piece to the jewelry store where you purchased it for repair; you might be surprised at how many jewelry stores have their own craftspeople on staff and can handle the repair in-house. If that’s not possible, seek a trained custom jeweler or bench jeweler. Besides heading to the jewelry store, there are things you can do yourself, but only if you know exactly what you’re dealing with. A gentle wipe with a clean, soft, lint-free cloth is safe for most jewelry, though even this could remove special patinas and finishes, especially on sterling silver, copper, brass and costume or art jewelry, so take care with those pieces. The dark bits you love on your silver jewelry? That’s patina from oxidation. If you like it and want it to stay, don’t rub it with a cloth or anything else! 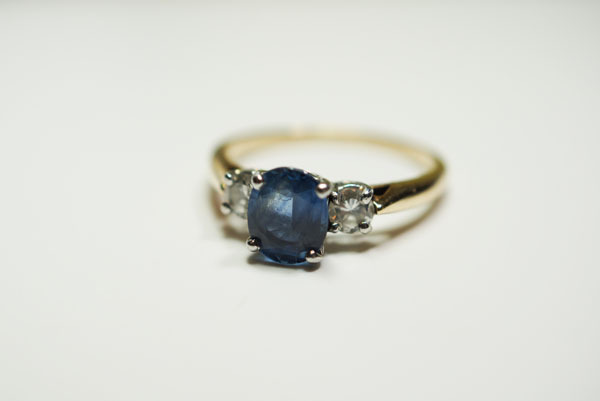 I myself have been known to clean a diamond or sapphire ring with a good soak in water and dish detergent, and a gentle scrub with an extra-soft toothbrush. A sapphire and diamond ring often has numerous options for cleaning, due to the nature, structure and durability of the gems. Image copyright HUWBijoux, LLC. In both cases, however, we’re talking about stones that are hard and not easily scratched, nor were the stones treated with treatments that could be impacted by detergent or water, and I knew that for certain. You can be just as certain that there are plenty of experts who would cringe at the soak-and-brush “technique.” Why? For one reason, in some cases, detergent can ruin your stone. 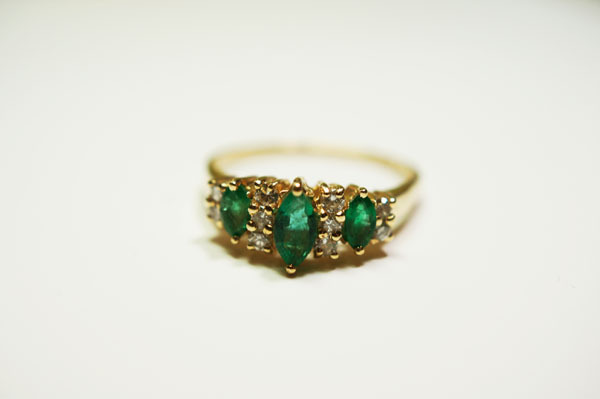 Emeralds are frequently treated with oils to improve their appearance. This is a technique dating back many centuries, and is considered an “accepted” treatment so long as it’s disclosed to the customer. But just as detergents are great at removing grease from dishes, they’re also really good at drawing out the oil from an emerald. You would likely have a very unpleasant surprise at the appearance of your oil-less emerald, though the good news is that emeralds can be re-oiled by qualified practitioners, so it would be possible to restore the emerald’s formerly treated appearance. Emeralds are frequently treated with substances like oil, resin or polymer to improve their visible clarity and overall appearance. These treatments require special care, especially during cleaning, and should be disclosed at the time of sale. image copyright HUWBijoux, LLC. As with emeralds, there are numerous types of gems that have natural characteristics – or are treated – that could be negatively impacted by detergents, ultrasonic vibrations, the shock of steam, scrubbing brushes, or any number of other cleaning processes. So tread carefully, and seek professional guidance – a trained jewelry appraiser, gemologist, or gem lab – if you’re unsure about what you’re dealing with. For jewelry that is strung or knotted, as pearl necklaces commonly are, the simplest way to fix a piece that’s gotten stretched, broken, frayed or dirty, is to have it restrung. As with other repairs, the first stop should be the shop or artist from whom you bought the piece. If that’s not possible, seek another jewelry store or a local bead shop, which might offer restringing and knotting, or could refer you to someone who does. Worn frequently, knotted necklaces, such as pearls, may need to be professionally restrung every year. The advantage of knots is that even if the cord wears through and breaks, you likely won’t lose many beads, as the remaining knots will hold them in place. Image copyright HUWBijoux, LLC. 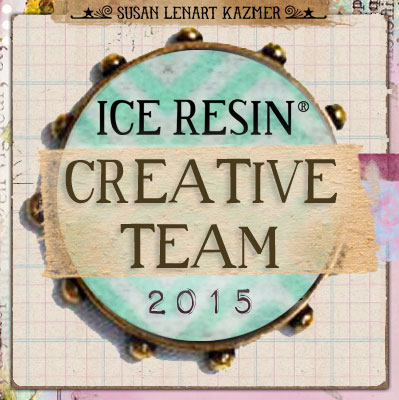 If your gemstone has been scratched, chipped, broken, or is just plain ugly, all is not lost. Scratches can be eliminated through repolishing. Chips or breaks can be modified through re-cutting. Stones that are unattractive due to their proportions or inclusions might be able to be re-cut. There are limits, however to both repolishing and re-cutting, and both require expert analysis beforehand, as well as highly skilled artisans for the actual work. Gemstone treatments and the unique qualities of each stone will determine whether a repair can be done at all, and quite likely the stone will have to be removed from its setting for the analysis to happen. Don’t give up hope simply because a stone is scratched or chipped or unattractive! I hope you’ve found this information helpful. Take care of your jewelry and you’ll have it in all its fabulousness for many, many years. So open your jewelry box! Take the family jewels out of the vault and put them on! Because, honestly, pretty jewels locked away and never enjoyed is just sad, sad, sad. If you don’t like a piece, give it to someone who will, or sell it, or melt it, or have it redone! But get it out and do something with it! So informative Heather. Who knew?